One thing I love about heraldry is its use of puns. The animal world has always provided heraldry with a wide-ranging source of these puns. In medieval days when few people could read the only way to remember or recognise whose coat of arms you were looking at was by puns on the owner’s name. For instance, many families called Lyon have lions in their coats of arms. Today I’m presenting 2 different lgbt achievements using a pun based on a bird – the pelican. In both of these you can see the heraldic pelican. Medieval Christian legend says that the pelican fed its young by pecking at its breast until it bled. The bird is pictured like this in many manuscripts, stained glass windows and the like. In this form it is referred to as a “pelican in her piety”. The Queer Achievement above belongs to Lt. Lord Arthur Pelham-Clinton (1840-1870). The 3 pelicans on his shield are puns on the name Pelham. Arthur’s father was the Duke of Newcastle, the owner of Nottingham Castle, and you can still see the family coat of arms carved over the castle gatehouse today. In 1865 Arthur was elected MP for Newark just up the road from Nottingham. At the time he was in a relationship with a stage female impersonator called Ernest Boulton, who often styled himself Lady Stella Clinton. Unfortunately, Ernest also often wore female attire in public (an offence at the time) and was arrested. Before the trial love letters between Ernest and Arthur were found. Arthur was called to give evidence against Ernest, and rather than face this prospect Arthur is said to have committed suicide. Lord Arthur’s paternal ancestry is the Clinton family. Their coat of arms can be seen in the 1st and 4th quarters of the shield. 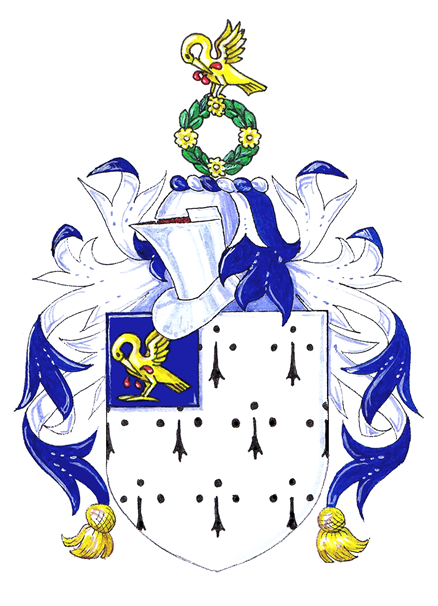 It was the marriage in 1717 of Arthur’s ancestor the 7th Earl of Lincoln to the heiress Lucy Pelham which brought the name and arms into the family. The remaining quarter on the shield, the white belt buckles, also belongs to the Pelhams. Legend says that this is an “augmentation of honour”, as it is known, granted personally by the king in recognition of some great service. The specific service here was performed at the Battle of Poitiers in 1356 by Sir John Pelham, who was one of the captors of the king of France. The buckles may represent the French king’s sword belt given in surrender. While this legend has been in the family for generations, it’s use in heraldry can’t be traced that far back, but that doesn’t mean it isn’t true. The Pelham motto “Vincit Amor Patriae” means “The love of my country prevails”. The Queer Achievement below belongs to a more recent member of the lgbt community, Julia Pell (1953-2006). Again, you can see the pelican being used as a pun on the family name. In the UK her arms would be shown on a diamond-shaped lozenge with a bow, but American arms don’t show any sexual differentiation. This is another coat of arms which dates back to the medieval period, and Julia’s male-line ancestry goes back over 600 years to the county of Lincolnshire. Her distinguished ancestry begins with her father Claiborne Pell, a Rhode Island Senator. Julia was a civil rights activist and served on the board of the National Gay and Lesbian Task Force, and as President of the board of the Rhode Island Alliance for Lesbian and Gay Civil Rights. The Pell crest shown here is one of several variations I’ve found. Each is an interpretation of the official description (the blazon). Sometimes the garland is shown as if it encircles the top of the helmet. Sometimes the pelican stands directly in front of the erect garland. My interpretation is based on the oldest depictions. One element missing from Julia’s coat of arms is the motto. I can’t find one for the Pell family. This isn’t unusual, as motto’s aren’t compulsory. In one of those quirks of history that brings 2 apparently unconnected people together, Lord Arthur and Julia have more in common than pelicans. Julia’s ancestor John Pell (1610-1685) inherited a large estate next to the modern-day Bronx area called the manor of Pelham and the Pells lived there for several generations. The Pell coat of arms is still seen in Pelham today. The manor was given that name by the aforesaid John Pell’s uncle Thomas, the first Pell to emigrate to America. Thomas named the manor after his childhood tutor Pelham Burton, and Pelham Burton’s great-grandfather was Sir William Pelham, the direct ancestor of Lord Arthur Pelham-Clinton. It’s a small world.